A vein is a blood vessel that returns blood from the tissues of the body back to the heart. The body has two distinct systems of veins -- superficial and deep. The superficial system is made up of veins that are close to the skin. These are the blood vessels you frequently can see on your hand arms, or legs that can become more prominent when you exercise. The deep system is comprised of veins within the muscles of the body. The two systems are connected by small communicating veins. The body regulates the amount of blood going through both systems as a way of rigidly controlling the body's central temperature. Deep vein thrombosis (DVT) is a condition wherein a blood clot forms in a vein of the deep system. DVTs can occur anywhere in the body, but are most frequently found in the deep veins of the legs, thighs, and pelvis. They may infrequently arise from the upper extremities usually because of trauma, or from an indwelling catheter (tubing) or device. When to give Thrombexx pre-operatively in patients taking spinal/ epidural anesthesia? 2 hours after needle insertion pre-operatively. Second dose12 hours after removal of the needle post-operatively. When to give Thrombexx pre-operatively in orthopedic & general surgery? As early as 5-15 minutes pre-operatively. Immobilized patient taking Thrombexx for 1-2 weeks before surgery when to give prophylactic dose pre-operatively (elective)? Thrombexx should be stopped 12 hours before operation. How the dose is not related to body weight like LMWH? Thrombexx inhibits thrombin circulating in the blood (it is not related to body weight) on the other hand, LMWH have 80% distribution in fat which is directly related to body weight. LMWH Monitoring is done by PTT ? What is needed to monitor Thrombexx? Not needed in prophylactic dose, PTT is not used to monitor efficacy it is used to monitor complications for bleeding. When HIT occurs, is it sufficient to stop the heparin only? 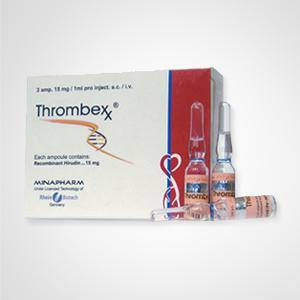 Stopping heparin alone is not sufficient, due to the massive activation of Thrombin molecule. Thats why the guidelines always recommend stopping heparins & start treatment with direct thrombin inhibitor. Thrombexx® cream: As an extension to Rhein-Minapharm's r-Hirudin portfolio, Thrombexx® 1120 I.U cream is introduced for the treatment of hematoma, thrombophlebitis and shunt thrombosis prophylaxis. 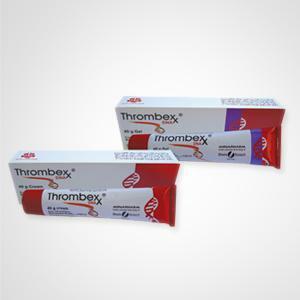 Thrombexx® Gel: As an extension to Rhein-Minapharm's r-Hirudin portfolio, Thrombexx® 1120 I.U gel is introduced for the treatment of hematoma, thrombophlebitis and shunt thrombosis prophylaxis.